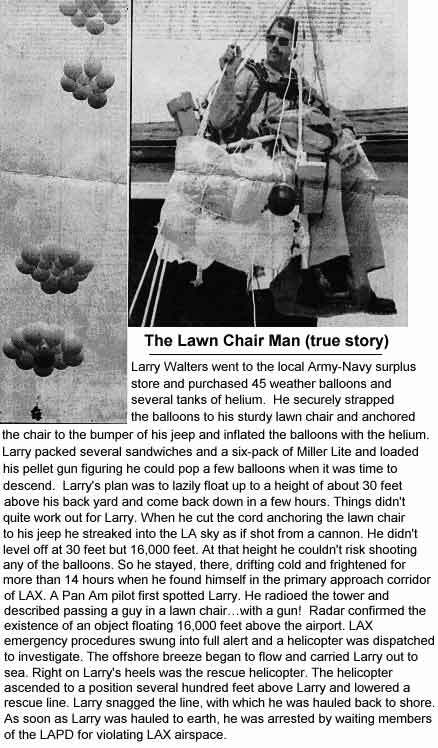 Lawnchair Larry, the man who soared to 16,000 Feet attached to weather balloons-Truth! - Truth or Fiction? Lawnchair Larry, the man who soared to 16,000 Feet attached to weather balloons-Truth! This story has been widely disbelieved by skeptics, but it really happened. TruthOrFiction.com’s Rich Buhler was hosting a radio talk show from Los Angeles in 1982 when Larry Walters’ historic flight took place in from nearby San Pedro and he covered the story for his audience. It was widely reported by the news media at the time and Larry Walters became something of a folk hero for his daredevil solo flight. According to published reports, Walters was employed as a truck driver in Southern California. 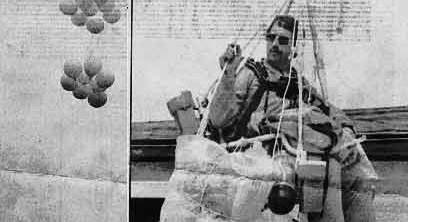 On July 2, 1982, he fastened 42 surplus balloons to a lawn chair and launched from his girlfriend’s San Pedro home. He carried various supplies with him as well as a CB radio and a BB gun to shoot balloons one at a time to descend. He didn’t realize how powerful the buoyancy of the balloons was. When he cut a rope holding him to terra firma, he took off with such a jolt that another anchor rope broke under the stress and he shot upward so quickly that his eyeglasses flew to the ground. He floated around the L.A. basin for several hours and reached altitudes of up to 16,000 feet. According to an article in the New York Times the next day, Walters was spotted by pilots from both TWA and Delta Airlines. It was cold at 16,000 feet and he started shooting some of his balloons to descend, but dropped his BB gun and had to wait for his rig to come down on its own. He landed in a residential neighborhood in Long Beach where got tangled in some power lines, causing a power blackout. He told reporters that his weather balloon flight had been a dream of more than 20 years. Larry Walters died eleven years after his flight from what the Los Angeles Times described as a self-inflected gunshot wound. The Phone Call you Got About Jury Duty May be From Crooks-Truth! 400 Christians saved from tsunami death in Indonesia?-Unproven! How Bikers Handle PETA Protesters-Fiction! Old Pictures From a Brownie Camera of the Attack on Pearl Harbor in 1941-Fiction! Video of Hypnotized Bunny Taking a Shower-Truth!